Employees of a New York-based travel magazine enjoy life on the move and in the big city. Bold Traveler takes readers around the world as relationships develop and college grads find their true calling. Updated paragraph-by-paragraph every weekday. Bold Traveler has not been tagged yet. Help others find Bold Traveler by tagging it! 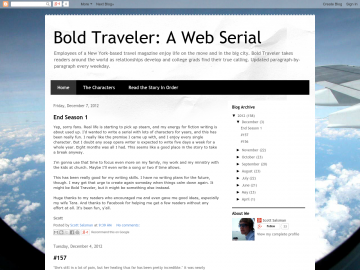 Bold Traveler has not been reviewed yet. Bold Traveler has not been recommended yet.